Going to Alaska in the winter might not seem like an obvious move, but I was surprised on a recent visit at just how crowded Anchorage’s Spenard hostel was in the dead of winter — or Anchorage for that matter, as people streamed in from the airport. 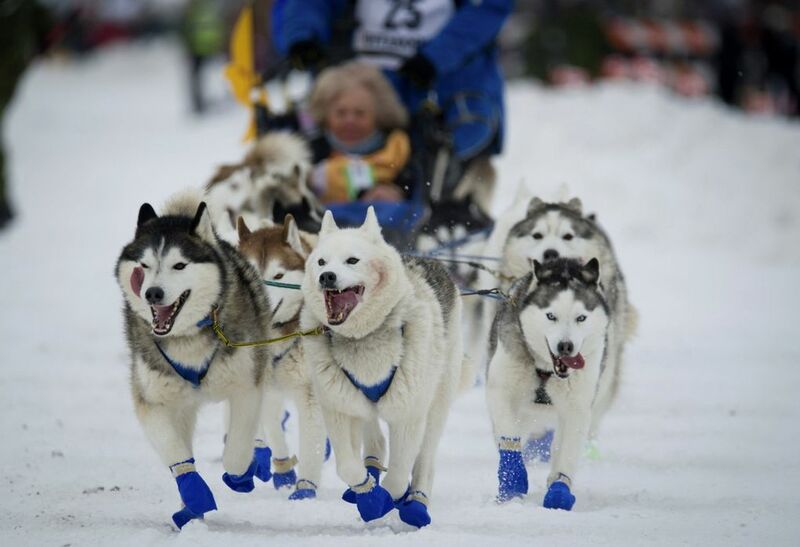 Hotels and the other hostels were filling up with guests coming to volunteer at or watch the Anchorage Fur Rendezvous Festival held annually in late February, its events dovetailing with the start of the world-famous Iditarod race, slated to begin March 2 this year. In 1935, when Anchorage had only 3,000 residents and was relatively cut off from the world, resident Vern Johnson started the Anchorage Fur Rendezvous Festival as a way for locals to let off steam. At the time, fur production was Alaska’s second-largest industry. Since then, the festival has transformed into a celebration of the end of winter and Native customs; it’s also a time to act zany after being cooped up all winter. The original Anchorage event included skiing, hockey, basketball, boxing, a bonfire and a torchlight parade. More than 100 events are slated for the present-day Rondy (as it is known to locals). Among them are America’s oldest street race, two days of fur auctions with actual mountain men bringing in their wares, a charity ball, the Mr. Fur Face beard contest, a three-day 75-mile dogsled race, the World Championship Dog Weight Pull, the Miss Fur Rendezvous Pageant, a carnival, the grand parade, running of the reindeer (herds of people run four blocks with reindeer as a spoof on Pamplona’s running of the bulls) and figure-skating contests. It’s all capped off by outhouse races (featuring outhouses on skis), a multitribal gathering and Native arts and crafts show, fireworks and the start of the Iditarod Race. In anticipation of the Iditarod, downtown Anchorage’s Fourth Avenue is blocked off so that hundreds of cheering spectators can line the street, which becomes a sled-dog track for the 53 mushers signed up to travel more than 1,000 miles to Nome. The endurance race over the Alaska Range through wilderness can take anywhere from five days to two weeks depending on the weather. The route commemorates the mushers who raced against time in 1925 to save the children of Nome from a diphtheria epidemic. Along with the festivities of Rondy, other winter pursuits are plentiful in Anchorage: 135 miles of multipurpose trails lend themselves to fat-tire biking and visitors can explore a variety of cultural centers and museums, including the Anchorage Museum, the state’s largest, with a collection of historical and contemporary Alaskan art. For a lesser known museum, try the Wells Fargo Museum in Midtown, with intriguing exhibits on minerals and mining. Also on the docket? Glacier-viewing and skiing. In February and March, visitors can take “flight-seeing” tours of nearby glaciers. Lazy Otter operates Blackstone Bay glacier cruises in nearby Prince William Sound. And some 30 miles south of Anchorage, you’ll find the Alyeska Resort in the former mining hamlet of Girdwood. The ski resort includes the mountaintop Mt. Alyeska Roundhouse, listed on the National Register of Historic Places. Take a tram to the top for breathtaking views of Glacier Valley meeting the ocean. Another reason to go north in winter? A chance to view that array of green, red and white lights dancing across the night sky — the aurora borealis. A winter train departs from downtown Anchorage on Tuesday and Thursday mornings at 8:30 a.m. and arrives in Fairbanks at 8 p.m. 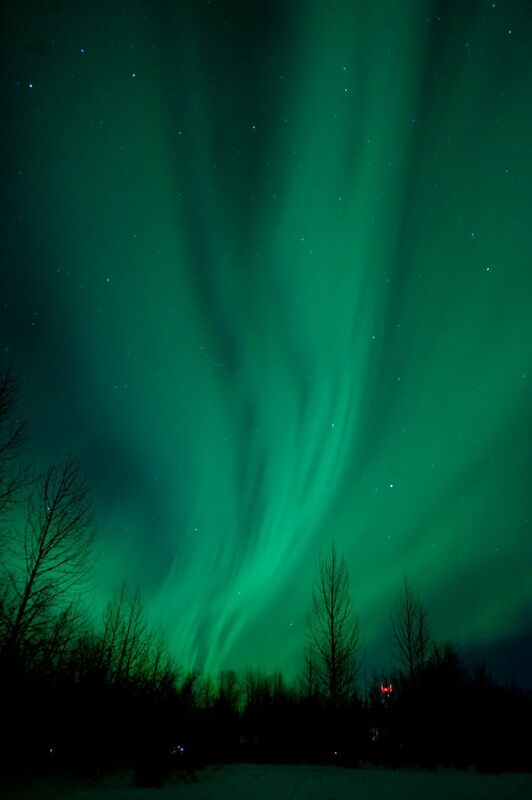 There, you’ll find a number of aurora-focused excursions, as well as the University of Alaska, Fairbanks’, stunning Museum of the North and the Fountainhead Antique Auto Museum. Rent a car and drive east out of Fairbanks to Chena Hot Springs (56 miles away). There, the water reaches temperatures of 165 degrees, and a resort built in 1912 features indoor and outdoor tubs, Jacuzzis, an indoor family swimming pool and the Aurora Ice Museum, the world’s largest year-round ice museum with its own ice bar. For meals, Anchorage restaurants run the gamut from fine dining (Jen’s, Simon and Seafort’s, Glacier Brewhouse, Kincaid Grill) to casual and fun (Moose’s Tooth, Snow City Cafe, Peanut Farm, Bear Tooth, Gwennie’s). If you go to Girdwood, you must try the eclectic Double Musky. Alaska has 21 breweries, and many are in Anchorage. You’ll also find some very interesting watering holes: Chilkoot Charlie’s, Peanut Farm, Humpy’s, F Street Station, McGinley’s Pub and the ultimate Alaskan dive bar, Darwin’s Theory. The Millennium Hotel’s Fancy Moose offers a spectacular view of Lake Hood. Compact downtown Fairbanks also offers good eats — try Lavelle’s or Pike’s Landing. For dining outside the city center, the Turtle Club and Ivory Jack’s are worth the short drive, as is Chatanika Lodge, a genuine roadhouse with a 1955 Thunderbird under glass. The Alaska Coffee Roasting Co. is arguably the state’s best coffee house.